Growing up on a wheat farm in rural Wyoming, the Sandberg sisters often looked to the big night sky and thought of the possibilities. Now, they don’t have to wonder what’s up there, because the graduates of the University of Wyoming have careers and opportunities that allow them to see it. Julie (Sandberg) Read and Lori Sandberg are examples of what is possible if you dream big, and use UW’s resources to help you get there. They both received degrees through the UW College of Engineering and Applied Science (CEAS). Read grew up in Albin about 30 miles east of Cheyenne on the Wyoming-Nebraska border. The town had about 187 people, and she was part of the last graduating class for the town’s high school. She now calls Houston home and is enrolled at Texas A&M University in pursuit of a Ph.D. in aerospace engineering. She remembers her time at UW as a valuable experience in terms of personal growth and education. She also had the opportunity to participate in programs such as the national engineering society Tau Beta Pi (TBP), the UW Experimental Program to Stimulate Competitive Research (EPSCoR) and had multiple internships. She credits TBP for helping both she and her sister improve communication and leadership skills. “Those experiences helped me get my first job, get into graduate school, and I hope will look strong on my resume to get my next job. It was really easy coming from UW to participate in those opportunities,” Read adds. Read led the way for her sister, enrolling at UW after participating in the Engineering Summer Program (ESP). Her parents both attended UW, but Read had no idea what she wanted to study. She ended up with a bachelor’s degree in electrical and computer engineering in 2007. 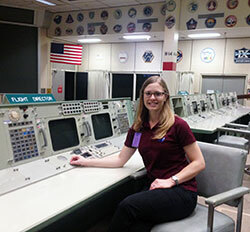 She earned a master’s degree in aerospace engineering from Texas A&M and, after her master’s, she worked for more than two years for aerospace contracting company Odyssey Space Research. But, her quest wasn’t over. So, she enrolled for her Ph.D. and hopes to have that by Christmas 2016. She commutes to College Station for classes. 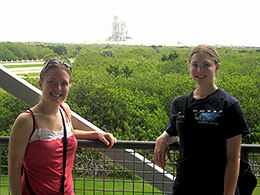 Along with her schoolwork, she has an internship at NASA’s Johnson Space Center in Houston. She hopes to integrate her research in the organization’s software. If astronauts are headed to space and need to abort the mission, software tools can help figure out the best path home, especially if they lose radio contact. Once she graduates, she hopes to work for NASA, a return to her roots from her time at UW and the Wyoming NASA Space Grant Consortium. Read always had her younger sister in mind when she pursued difficult areas of study. Despite being three years younger, Sandberg has made a name for herself. After Albin shuttered its high school, she finished at Southeast High School in Yoder. From there, she attended and graduated from UW with a bachelor’s degree in mechanical engineering in 2010, and earned a master’s from Texas A&M in 2013. She took a job with aerospace and aircraft giant Boeing in Seattle to begin her career and relocated to Texas about a year ago. Her journey into engineering also began at ESP and continued at UW. 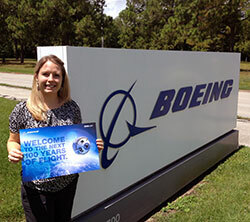 She had an internship with Boeing after her senior year of college, which, in turn, helped her land her current post. Sandberg watched her older sister as she grew up and wanted to emulate her in just about everything. She went to UW, joined the same sorority and ended up in the same career field. CEAS Associate Dean Steve Barrett watched as both sisters excelled at UW and noted the pride felt by their parents and staff and faculty of the CEAS. He knew early on that they’d find their calling. Sandberg is not immune from taking time to see how far she has come in recent years. Coming from a small town in Wyoming didn’t hold the sisters back. To the contrary, it served as a reminder of staying true to your roots but never settling for less than what you want.